Hornick Studios would like to take this opportunity to congratulate you and your fiancé on your engagement. Wedding plans can take many months to finalize the details just the way you dreamed. Wedding memories captured on video by a professional are considered priceless. You will be able to experience again all the emotions and details of your wedding day. The soft whispers of “I do,” your first dance as husband and wife, the cutting of the cake, and your family and friends having a great time at the reception. Hornick Studios takes pride in capturing your special day with professional state of the art equipment to ensure the best picture quality available. We will videotape your wedding documentary style. We will produce your video with care to provide an excellent interactive BluRayDVD to cherish forever. Hornick Studios invites you to visit the Screening Room to preview samples of work for clarity, color, sound, and artistic talent. Call or email us today, we look forward to making your wedding memories last forever. Satisfaction guaranteed. We do offer off season rates for weddings held on non holiday weekends after Thanksgiving through March 31st. Weddings held on Friday evenings and Sundays are also considered off season. Please inquire for the discounted rates if your wedding falls within the off season rate. We will use multiple professional high definition digital cameras on every package to provide a true professional coverage. We believe that clear audio is half the picture so we use multiple microphones that include a wireless lapel microphone placed on the groom to capture the soft exchange of the vows crisp and clear. Other recording devices may be used for musicians, podiums, readers, pastors and occasionally the father of the bride. Our artistic and creative computer editing process allows us to incorporate musical overlays and tasteful effects without overwhelming the video. We like to keep the video flowing as how the wedding took place. We do offer an assortment of additional options to make your video more enjoyable and personal. Please inform us on what you want your video style to be. Please see Additional Options page for more information. We can add a photo-montage consisting of your pictures growing up through the years, add your honeymoon pictures, create a cinematic artistic highlight video in addition to your long version video. For your fun, we can produce your “Love Story” video that may be used for a video announcement of your engagement, a video invitation for your wedding or just a large screen presentation at your reception. Please ask about our larges screen projection system. We offer high definition BluRay DVD’s with custom designed menus that include linked chapter marks that will take you right to the exchange of vows, first dance, cake cutting and more. 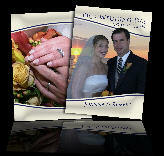 The DVD menus are designed with elements from your wedding day. Please scroll through our video samples at the Screening Room to preview sample DVD menus. We also include personalized custom printed DVD case inserts for all our packages.